A Trademark Counsel with the IPR GROUP since the beginning of 2017. 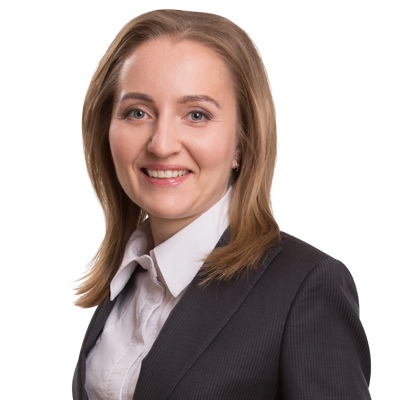 Valeriya is an expert in preparing trademark applications and drafting legal opinions on provisional refusals, as well as objections and appeals. She also provides consultations to the clients on a wide-range of trademark-related issues such as trademark renewal, assignment and licensing. Valeriya is an International Relations Politologist and a Translator/Interpreter of English and Farsi with a Master’s Degree in International Relations. She continued her education at the Alfred Nobel University and got a Master’s Degree in Finance and Credit. Her work experience includes tutoring at the Department of International Relations and Foreign Policy, Kyiv International University. She has worked as an English and Farsi Interpreter for the Hebrew Immigrant Aid Society in Kyiv, a Technical Assistant at the Consular Section of the Embassy of Ukraine in the Federal Republic of Nigeria. Valeriya also has a work experience in a Australian law company. Valeriya’s favourite pastime is Psychology. Languages: English, Russian, Farsi, Ukrainian.